The notorious Mardi Gras season is officially under way and is marked by celebration, tradition, and indulgence. As a parent, you may be weary of bringing your children to streets crowded with party seekers. However, your children can also experience the joy of the Carnival season. We’ve gathered some helpful tips to keep your festivities safe and stress-free. Parking Plans. Parking is always an issue during Mardi Gras so scope out your destination ahead of time. Numerous potty trips are inevitable; stake your claim to an area near a public restroom. Identification Safety. Be prepared for large crowds and take precautions in case you are separated from your child. Placing your contact information on a lanyard and putting it under his shirt or using a permanent marker to write your phone number on the inside of his arm are two ways to ensure safety. If your child likes to wander off, consider some type of system where you can be tied or attached to your child. Picnic Time. While waiting for the first parade float, it’s the perfect time for a picnic to fill those bellies before the excitement commences. Bring sandwiches, snacks and plenty of water. Don’t forget a blanket as well as a bag for garbage. Keep it family-friendly. 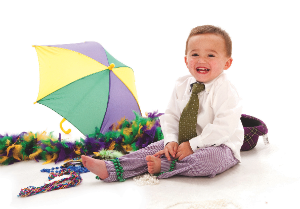 Avoid bad neighborhoods and night parades in New Orleans if your young children are in tow. Some happenings are best left unseen and the atmosphere may lean towards unpredictable. If you want to take your family to a night parade, stick to Metairie or smaller communities in the Baton Rouge area. Weather Watch.Attending a parade can turn out to be a pretty long day of battling the elements so even if it’s chilly, consider sunscreen and lip balm. You may even want to bring a festive umbrella for shade. Check the weather report and don’t let poor planning rain on your parade. It is south Louisiana―the weather could change at any time. Sitting in Style. Just in case your shoulders get tired, try an alternative option like the popular ladder seat. Keep in mind that they can be dangerous so make sure to support the ladder while it is occupied and don’t leave your child unattended. Find out how to make your own at www.momsminivan.com/extras/ladderseat.html. Goody Bag. Your children will be catching everything from beads to balls to bulky stuffed animals so unless you want to leave things behind, bring some sturdy bags for the excess of goodies. Trendy transportation. Another Carnival essential, a decorated wagon is a fun option instead of the bulky stroller. Your child will enjoy the change in transportation and will have an extra place to store his catch. Celebrate. Have fun and forget about your troubles. Show your children that you, too, can be carefree. Grab some old Halloween costumes for the entire family and let your hair down. Take pride in sharing such an exciting celebration with your little ones. Tradition Talk. If your children are old enough to understand, talk to them about what the celebration is all about. Even if you’re not Catholic, the tradition of the event has historic and cultural value. It’s stood the test of time beginning in 1699 and was celebrated in Paris before that. 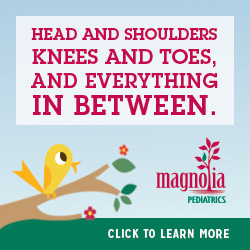 If it’s your first parade or a much-anticipated annual event with your loved ones, remember to be careful and, as we say in Louisiana, “laissez les bons temps rouler” (let the good times roll).